​Newcastle manager Rafa Benitez has said he hopes record signing Miguel Almiron can be involved at some stage against Wolves next Monday, after the 24-year-old sat out the 1-0 defeat to Tottenham on Saturday. 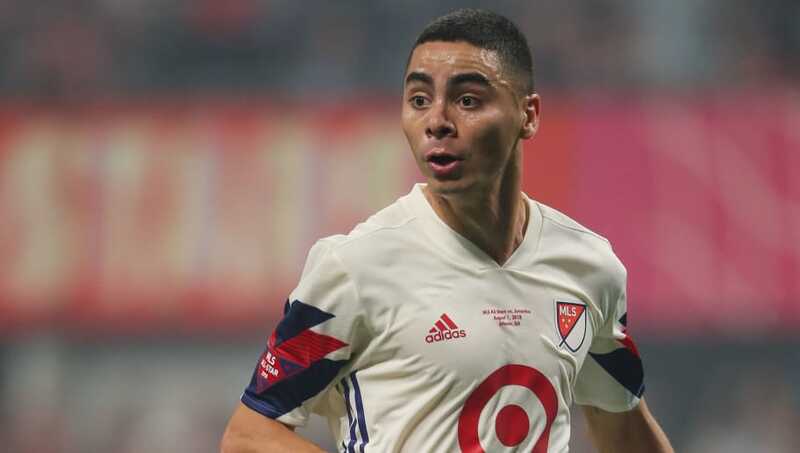 Almiron's £21.5m move from Atlanta United on Deadline Day meant he surpassed Michael Owen as the club's biggest ever outlay for a single player, but visa issues meant the Tottenham game just a day later came too soon to make his debut. "I hope so," said the manager. "I think he will be fine with the visa and the work permit, and hopefully then he will train with the team. "We will see how fit he is, because he was starting the pre-season in America. Hopefully, he will be fine." Almiron's deadline day move was accompanied by the loan switch of Monaco left-back Antonio Barreca, who was substituted on for his debut in the defeat to ​Tottenham. The last minute transfer business has been heralded as a potential turning point in what has so far been a disappointing season for ​Newcastle, who sit in 15th place, just two points clear of the relegation zone - but it remains to be seen what sort of impact either will have in the long-run.